The Morley Nelson Snake River Birds of Prey National Conservation Area is a mix of public and private properties: 485,000 acres of BLM land, 65,000 acres of private property, 39,000 acres of state land, 1,000 acres of DOD property and 10,000 acres of surface water, for a total of about 600,000 acres. The property was designated in 1993 in order to preserve and protect this unique environment where what is probably the world's densest concentration of nesting birds of prey naturally occurs. In this area you'll find all sorts of eagles, hawks, falcons, kestrels, owls and other raptors, about 800 nesting pairs altogether. This is a place with very few human-oriented amenities: you come here to hang out with the raptors on their terms. The best time to view the birds is from mid-March through June, in the early morning and again in the early evening hours. Camping, hiking, picnicking, boating, fishing, hunting, OHV riding and wildlife watching are allowed on most of the property. There is one developed camping area at the Cove Recreation Site but primitive camping is allowed almost everywhere on the public lands of the NCA. Vehicles are required to stay on the already existing roads and trails. 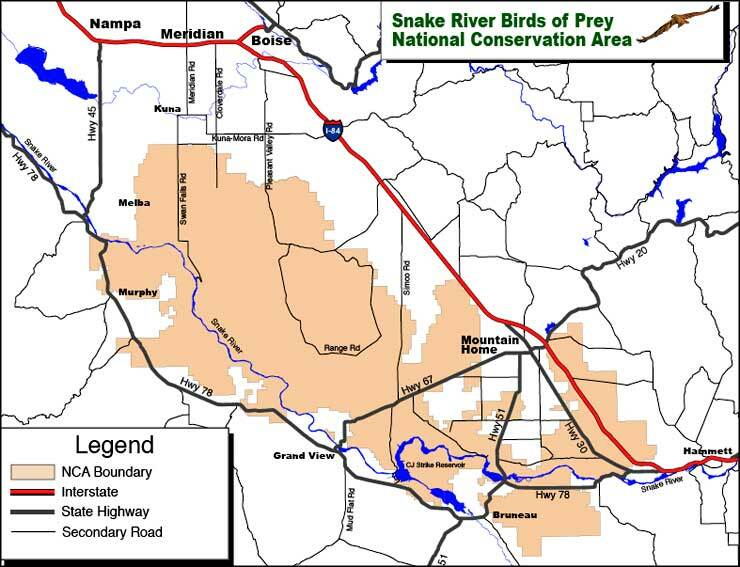 Easiest access to the property is via the Western Heritage Scenic Byway (Swan Falls Road): about 3 miles south of Kuna the road crosses the boundary of the Morley Nelson Snake River Birds of Prey National Conservation Area. Idaho Highway 78 wraps around the south and west sides of the NCA. Idaho Highway 67 crosses the property between Mountain Home and Grand View. 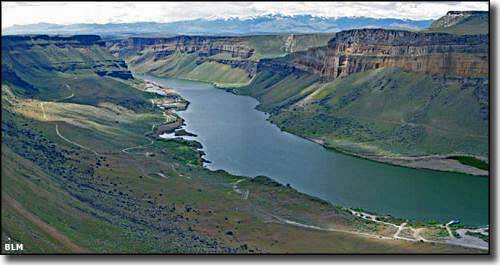 Grand View is the eastern terminus of the Owyhee Uplands Back Country Byway. 14,000 years ago, the glaciers were melting and the ice receding northward. In eastern Idaho, Lake Bonneville formed of meltwaters held back by the natural contours of the land. Eventually, it breached the rock at Red Rock Pass. At that point, a large part of the 20,000-square-mile lake began pouring onto the flat volcanic Snake River Plain and washed boulders the size of houses downstream. The peak water flow at Swan Falls was estimated at 33 million cubic feet/second. That water flow left behind deep, fertile soil that has since grown substantial vegetation in all that volcanic rock. Today, the area supports a huge population of small burrowing mammals like the Paiute ground squirrel, badger and black-tailed rabbit. These mammals are among the favorite foods of raptors like the prairie falcon, golden eagle and others. However, the BLM still allows the Idaho National Guard to use parts of the area for training exercises and between that and the large number of recurring wildfires, raptor populations in the area are at risk. 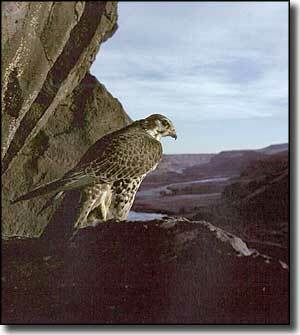 It's estimated that the number of prairie falcon breeding pairs crested at 230 and has since dropped to about 110. Along the Snake River you'll also find some of the oldest and most remarkable Native American archaeological sites in Idaho. There are also substantial areas of well-preserved wagon ruts from Oregon Trail days. You'll also find several places near an 1860's gold mining settlement that are presently listed on the National Register of Historic Places.